As Duo week (belatedly) winds down, we’ll take a look at the Rockman 2: The Power Fighters prologue that appeared in the official game soundtrack booklet ~ a version of the story that didn’t appear anywhere else. Action! Somewhere in outer space, there existed two very extraordinary types of energy. A white energy that was exhibited by those of a virtuous spirit, and a black energy which was sustained by hearts consumed with wickedness. These energies greatly exceeded anything which the civilizations of Earth had ever known. Then one day, an unknown energy form was discovered. Dr. Right immediately undertook an investigation. However, proper analysis proved impossible, as the energy form was so infinitesimally small, and yet at the same time so exceedingly dangerous that it had to be handled with the strictest of care. That’s because this energy form had a far stronger power than any other energy that existed on Earth. Then late one night, the town was suddenly stained red in panic. The Wily mechs struck in a surprise raid upon Dr. Right’s laboratory, making off with the portent energy, and even stealing the experimental energy parts which were developed from its research. Dr. Right: Damn! They must have taken the energy form. If Wily misuses its power, the results could be disastrous! Roll? Roll, where are you? Roll! Making things worse, Roll was nowhere to be found. That was when Rockman arrived, returning from his patrol. Rockman: Doctor! What on Earth happened here?! Dr. Right: We were suddenly attacked by Wily’s robots. They took that rare energy form, and the new parts I was developing. On top of that, Roll has gone missing! Rockman: That awful Wily, using such a cowardly attack! Meanwhile, someone was gazing down at the town thrown into confusion. Standing nearly 3 meters tall and possessing an enormous left hand, the figure burned with a violet haze, manifesting his will to fight. Duo: What a deplorable creature you are. Whatever it is you’re up to, I, Duo, will defeat you! And so the mysterious character “Duo” abruptly appeared! Is he friend or foe? And just who is this “creature” he’s targeting? Rockman’s latest battle is about to unfold! 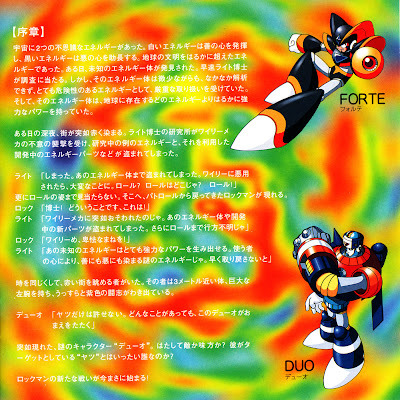 This soundtrack came out a few months before Rockman 8 released, so the bits explaining the good and evil alien energies were entirely unknown at the time. And the connection between the two, the potential for the basic energy form to become one or the other based on the intentions of the user, was not touched upon in 8 at all. It’s interesting that the two energies are figuratively two sides of the same coin. Good or Evil, depending on what dreams lie within your soul. Limitless potential and limitless danger, aren’t the two always the same somehow? And how about that “mysterious” Duo guy? I don’t think they really succeeded with making it hard to tell which side he was on, but anyone who plays the game and selects Duo as first player will immediately be greeted warmly by Dr. Right within seconds of playing, so I guess it’s a moot point. If Duo is approximately 3 meters tall as written here, and we know Rockman stands at 132cm, then Duo should be taller than two Rockmans stacked on top of each other. The sprites have never quite done him justice in that case, although the endings and cutscenes usually do a better job at portraying his height. And why a violet aura? Isn’t purple supposed to be the color of the Evil Energy? In Rockman 8 yes, but in The Power Fighters, Duo’s charge-up and attacks had a purple glow instead of the blue he’s known for later. It might have been something they decided to change afterwards. Or it could be because blue was already Rockman’s dedicated shot color in the arcade games, while Blues’ were yellow and Forte’s were green, making purple just another way to have Duo stand out more in gameplay. Of course, the story above says that Good Energy is white and Evil Energy is black, so I guess there’s no official consensus on the color issue. But speaking of colors, how about that psychedelic background? Outta sight, man. 2 Comments to "Big Duo, it is now SHOWTIME!" I second that! Then I wouldn't have to spend all my money on books and soundtracks and… okay, okay. I was gonna spend it on that anyway. But still.